I've seen a lot of galaxies, but I have to admit that this image just made my jaw drop. How lucky are we to live in such a splendid universe? This is UGC 1810, which is in the process of colliding with a galactic neighbor. 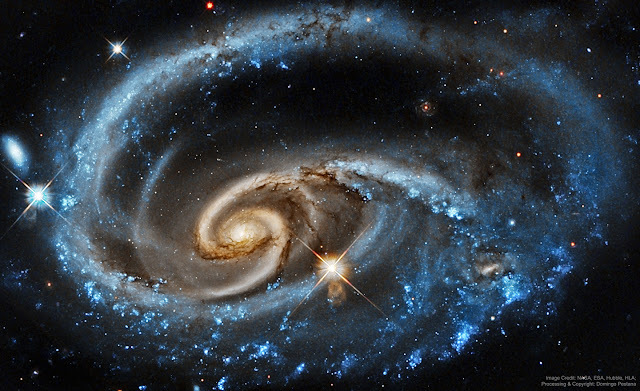 All the brouhaha has resulted in that striking ring of hot young blue stars around the more traditional spiral form; in another billion years or so, UGC 1810 will pull the kids into line, they'll cool down a little, and the galaxy will look more like a typical spiral. I'm on jury duty, in Federal Court, so no electronic devices of any kind are allowed. I don't mind having to read a dead-tree book rather than my Kindle, but I do wish I could bring my camera or even my phone. The weather has been gorgeous, if windy, and I could have taken a hundred pictures of the skyline yesterday.